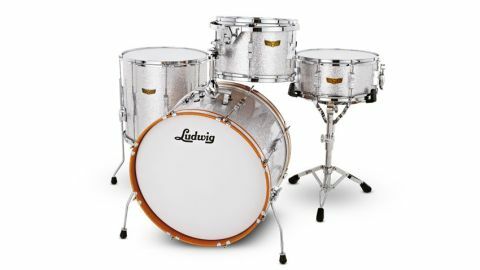 Ludwig's Club Date is different from anything else on the market - a vintage design successfully updated, resulting in a surprisingly flexible alternative kit. Rounded bearing edges. Unique shells. Vintage looks. Finishes. For vintage Ludwig enthusiasts the Club Date conjures up a less complicated era when the company made two types of drum - pro and student. From 1962, drummers unable to stretch to a Super Classic could opt for the cheaper Club Date. Ludwig - playing on its fine history, and why not? - has now resurrected the Club Date in this updated guise. Fifty years ago the Club Date had similar mahogany-poplar shells to Ludwig's pro lines. But times have changed so that budget kits are vastly cheaper than top line kits and companies employ several shell lay-ups. "The new Club Date has six-ply shells of cherry and gum wood"
In fact the new Club Date has six-ply shells of cherry and gum wood. The cherry, as seen lining the insides of the shells, is an attractive hazel-brown colour with a wavy grain, while the gum is a softer, pale coloured filler wood. The bass drum and toms have straight-sided shells with the most bold vintage touch, which is bearing edges that are not sharp like modern edges, but completely rounded. The snare drum differs, taking the vintage path one step further with its inch-deep reinforcing rings. Its shell is 4-ply cherry/gum and the re-rings are 4-ply birch, not solid maple like the '60s ones. The edges are again fully-rounded though, and there are proper snare bed depressions cut into the bottom of the shell. Now the thing that really distinguished the original Club Date, and is the visual identifier of the new version, is the lug set-up. This is where big savings were/are made in hardware and construction time. Double-ended Streamlined Classic lugs are employed on all the drums - small (6cm) versions on the snares and small toms, enlarged (10 cm) versions on the floor toms and bass drums. This results in much-elongated tension bolts - fully 8" (20cm) on the bass drum - which you have to be careful not to get bent. Note also that there are only eight lugs on the 22" bass drum, where there would be 10 on a top line bass drum. "Each kit is finished in one of three great sparkle wraps - Silver, Ruby or Olive"
There are three shell pack options: the Jazzette - 18"x14", 12"x8" and 14"x14"; the Downbeat - 20"x14", 12"x8" and 14"x14"; and the featured Fab-3 - 22"x14", 13"x9" and 16"x16". In addition, our Fab-3 has a 14"x61⁄2" snare drum. Each kit is finished in one of three great sparkle wraps - the Silver Sparkle of the review kit is just like Ludwig's vintage silver sparkle. Then there is Ruby Sparkle and Olive Sparkle. Additionally, and exclusive to the UK, there is a Club Date in Blue Oyster Pearl, called the 'Cavern', sponsored by the Cavern Club in Liverpool. Oyster Blue was the finish (albeit this is the later 'Bowling Ball' version) that adorned original Beatles drummer Pete Best's first Super Classic. In keeping with the retro vibe, the tom bracket is a rail consolette. It's a very different affair from that with which you had to contend in the 1960s though, being twice as strong and stable. The retro fold-out spurs are also sturdier than 1960s ones. And they actually reach the floor which the originals barely did! The classically proportioned 22"x14" bass drum has the now-standard clear single-ply batter with perimeter damping flap and a full white coated front head. Since the heads had to be mounted from new, we over-tightened them to stretch them and applied the bass pedal with a felt beater. An almighty dry and deep bonk emerged that bode well. After leaving for a while we slackened off the batter to just above wrinkles and took the front down by a half-turn. Now the drum started to speak more broadly, a massive but still fairly dry thump that really shifts air. The rounded edges reduce the head overtones so with both heads intact there felt less need for damping. "It makes you think that since most drummers damp their bass drums to varying degrees, maybe rounded bearing edges should be the norm?" It makes you think that since most drummers damp their bass drums to varying degrees, maybe rounded bearing edges should be the norm? You still get the attack and the sound is quite controlled, but there's a different resonance from the modern sharp-edge resonance - there's more 'feedback', more timbre, from the shell, an organic, woody tone. Finally, with the batter tuned right down you get one almighty crack, really thwacky. Next we set up the mounted tom. Updated rail consolettes have been slightly awkward in the recent past but this one is fine. The rail has a knurled surface to prevent rotational slipping, while the solid upright post is tightened by huge wing nuts. The 13" tom floats freely on its RIMS-style steel bracket with four-point mount rubber grommets. Already tuned on arrival, with the first strike you know this is going to be mega, resonating in tandem with the bass drum. "Tune quite high, '60s fashion, and there's a real ping with a dark undertow"
Again, the rounded edge gives an interestingly different timbre. Tune quite high, '60s fashion, and there's a real ping with a dark undertow - like John Densmore's toms with the Doors. The same applies to the 16"x16" floor tom. Overall the tom sounds, like the bass drum, feel disciplined but punchy. At just below medium batter tensions I found a sweet spot where the drums resonated fully with maximum sustain, and still the touch was velvety from those rounded edges. Finally to the 14"x61⁄2" snare drum which arrived slack and after tuning up just a little was strangely boxy and dark. We guess once more this is because of the rounded bearing edges which only function properly from medium tension up. Thereafter the drum had a distinctive tone and feel, dark and contained with a thicker backbeat, a pronounced, sustained 'chhh', rather than an abrupt snap. Once up to medium high, which is where this reviewer always seems to end, the drum was crisper - like mid-period Beatles when Ringo played a 14"x5" Jazz Festival snare with similar construction to this. Playing near the edges and playing rim shots produces more of a hollow clonk, but then that is true of all 61⁄2" deep drums as there is more air between the strike and the snares reacting. The rounded edges do not reduce the power of the drum but they do give it a warmer, deeper tone with more of the shell flavour. However, aim for the centre of the head and you get lots of snare wire response - you can feel the snares right there beneath you. Whether or not the unusual look of the Club Date appeals, there's no denying that the sparse hardware helps make this a big-sounding kit while the cherry shells and, more to the point, the rounded bearing edges, give it a warm, dark and thick tone.